Piano Action Regulation is the adjustment of the mechanical aspects of the piano to compensate for the effects of wear, the compacting and settling of cloth, felt and buckskin, as well as dimensional changes in wood and wool parts due to changes in humidity and wear. The action is the mechanical part of the piano that transfers the motion of the fingers on the keys to the hammers that strike the strings. The trapwork is the assemblage of levers, dowels and springs that connect the pedals to the action effecting sustain and dynamics. The damper system is the mechanical part of the piano that stops the vibration of the string when you release the key, and is controlled by the key and pedal systems. All upright and grand pianos need periodic regulation to perform their best (in addition to regularly scheduled tuning). Pianos actions that are out of regulation (adjustment) will prematurely decrease the life expectancy of the piano. Action regulation is a normal maintenance procedure. Frequency of regulation is dependent upon the amount of use, exposure to climatic changes, and the instrument’s quality, age and condition. 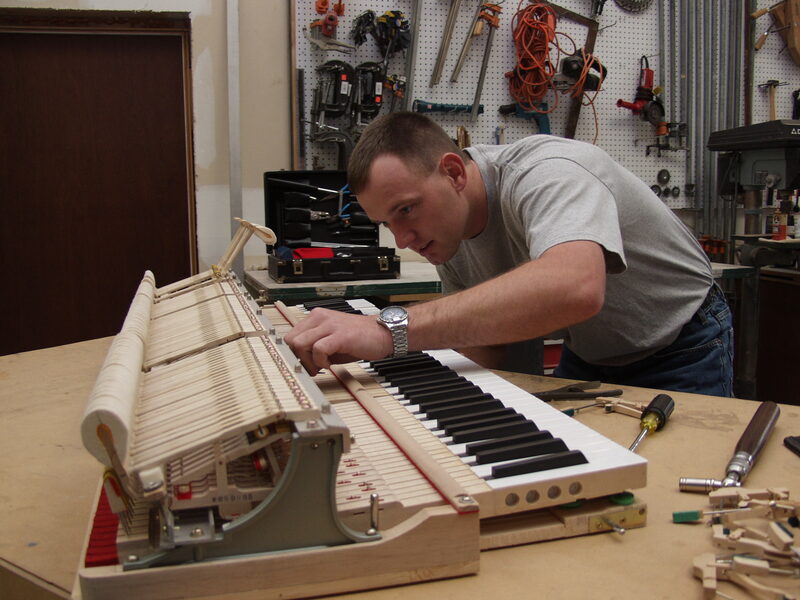 New pianos may require regulation in their first year as settling and compacting of parts necessitates adjustment. If your piano displays a lack of sensitivity or a decreased dynamic range, it is a candidate for regulation. No amount of practice can compensate for a poorly maintained piano. Poor legato touch, chord playing where all notes of the chord don’t speak clearly, a gradual loss of subtlety in phrasing and an inability to execute quick passages or note repetitions evenly may be the fault of a piano in need of action regulation – not the player. Help! My Piano Needs Service! Stop In For a Visit ! Evenings & Weekends: By Appt.